Londonist How Much Do You Really Know About Trafalgar Square? Trafalgar Square by Javier Ayala via the Londonist flickrpool. 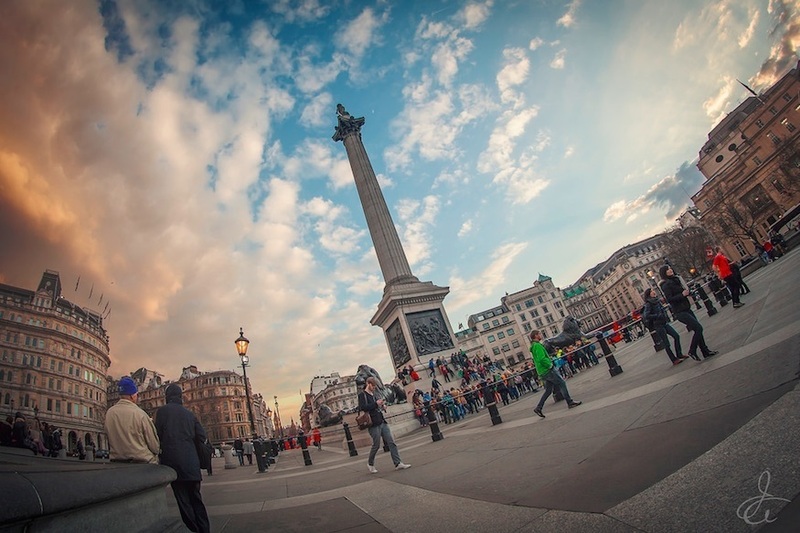 So you think you know Trafalgar Square? It's an easy assumption to make — the iconic part of London's landscape is as familiar as the rest of London's civic cliches. But there's much more to it than Nelson's Column and pigeon-feeding tourists, as Laura Porter explains. The Royal Navy fought the combined forces of the French and Spanish at The Battle of Trafalgar on 21 October 1805. Admiral Lord Nelson was on HMS Victory and although the British won the battle he famously died in action, elevating him to hero status. The land was part of the Great Royal Mews and used as stables by Whitehall Palace from the 14th to the late 17th century. 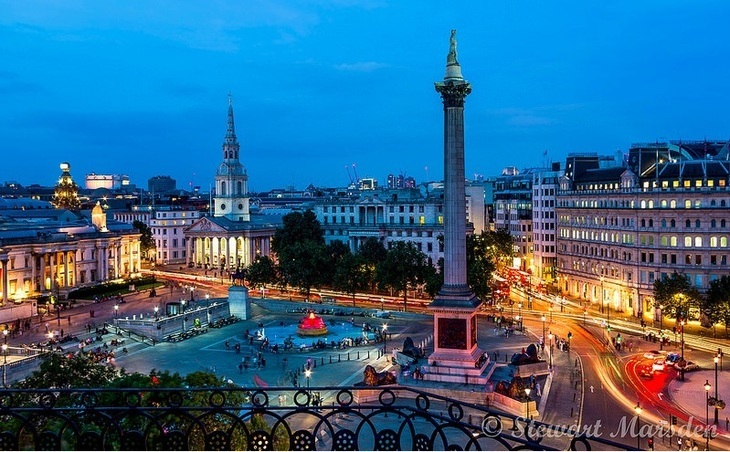 Trafalgar Square was built on the line of communications between the Mall, Pall Mall East, St Martin's Place, the Strand, and Whitehall. Photo by Stewart Marsden via the Londonist flickrpool. 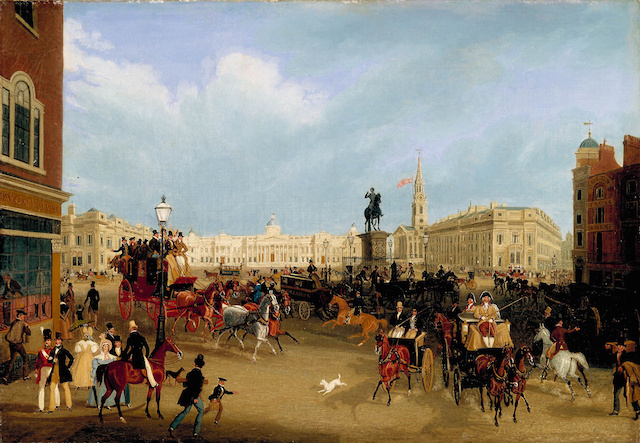 Once the communication link between Pall Mall and Portland Place had been completed in the 1820s, Commissioners of HM Woods Forests and Land Revenues instructed Nash to design Plans for Trafalgar Square on the site where the King's Mews had been. It was unnamed until 1835 and the name appears to have arisen prior to and independently of the erection of Nelson's Column. Work on locating the National Gallery along the north side of the square began in 1832 and was completed in 1838. This painting by James Pollard is c1836-43. Note, the National Gallery has been built but there's no Nelson's Column yet. Designed by the architect William Wilkins, he also submitted plans for the whole square, but died in 1839 so new plans by Sir Charles Barry (architect of the Palace of Westminster) were approved quickly. Following a letter to The Times in 1837 suggesting a permanent commemoration to Nelson, the Nelson Memorial Committee was formed. Clapham-born architect William Railton won the design competition. Work on the memorial started in 1840 and was completed in 1843. 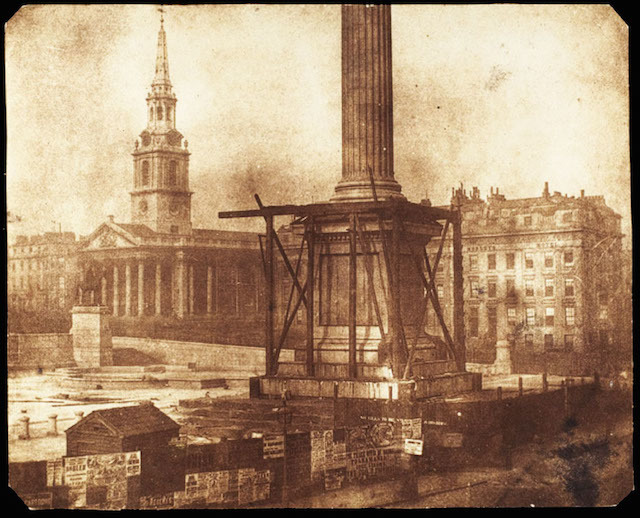 The construction of Nelson's Column. Photography by William Henry Fox Talbot in 1844. When it was first unveiled, it was called The Monument to Lord Nelson, although everyone calls it Nelson's Column these days. The column is built of granite from Devon. The four bronze reliefs around the base are by sculptors: Watson, Woodington, Ternouth and Carew. They show Nelson's most famous battles: St Vincent, Copenhagen, The Nile, and his death scene on The Victory. The figure of Nelson on top of the column was carved by EH Baily from Craigleith stone and is in three pieces. The four lions arrived 25 years later in 1868. They were designed by Edwin Landseer and cast in bronze by Baron Marochetti in his Kensington studio in 1867. Landseer worked from real lion corpses and casts of a lion statue in Turin. He strove for accuracy but he did make on big mistake: the lion's poses. In real life, lion's backs are convex, and not concave, when lying down. Photo by grahamvphoto via the Londonist flickrpool. Thomas Milnes originally made four stone lions, but they were judged not impressive enough for the memorial to Nelson, and were in the end bought by Titus Salt, and sent to his village of Saltaire, where they remain today. 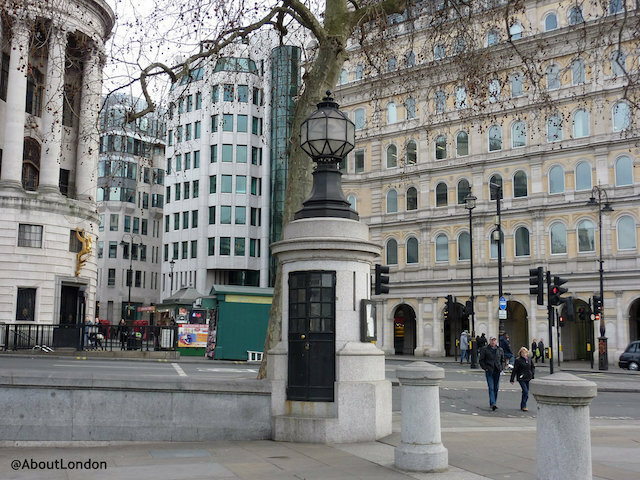 In the south east corner of Trafalgar Square, a one-man police phone box was installed in 1926, so officers could keep an eye on large gatherings and protests. These days the police phone box is used as a storage room by the cleaners. Due to a desire to reduce the space for public gatherings, apparently, two fountains were added in 1845 to a design by Charles Barry. These were supplied by two wells on Orange Street and in front of the National Gallery (Ian Visits has more information on this). 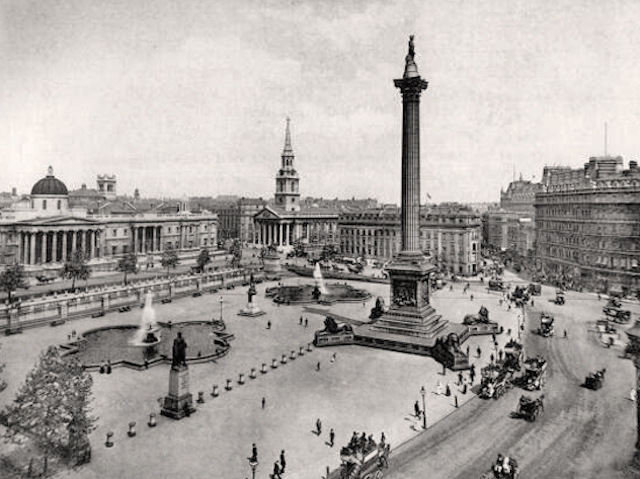 Trafalgar Square in 1890. Note the older fountains (and statues in the square). When the water flow became unreliable, it was decided to install new fountains. The central fountains were given to the Canadian Government and are now in Ottawa and Regina (see photos). In 1876, the Imperial Measures — detailing the official measurements of inches, feet, yards, links, chains, perches and poles — were set into the north terrace wall (and relocated in 2003, more information below). The UK adopted metric units of measurement in 1995 so these standards are no longer required, but for a long time this was where people could come to check the accuracy of their rulers after the Standards of the Imperial Units of Measurement were destroyed by a great fire which wrecked the Houses of Parliament in 1834. A Standards Commission, chaired by Sir George Airy (a mathematician and astronomer), created new standard units of measurement between 1838 and 1842 and decided to make three copies so the measurements would always be available. The Standards can be found in the Great Hall of the Guildhall outside the Royal Observatory in Greenwich and in Trafalgar Square. 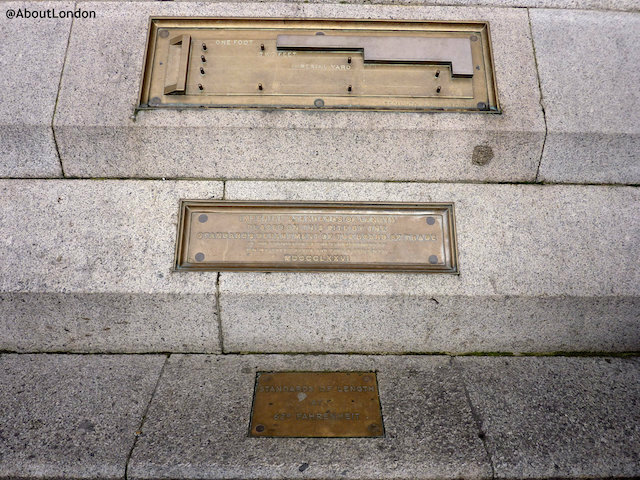 Imperial Standards of Length in Trafalgar Square. While inches, feet and yards are familiar, links, chains, poles and perches are less commonly-known measurements today. 100 links is a chain and a chain is the length of a cricket pitch. Rods, poles and perches are different names for the same unit. Medieval ploughing was done with oxen, up to four pairs at a time. The ploughman handled the plough. His boy controlled the oxen using a stick, which had to be long enough to reach all the oxen. This was the rod, pole or perch. It was an obvious implement to measure the fields, such as four poles to the chain. In 2003 traffic was blocked off from the north side of the square making a wide pedestrianised space. The central staircase was added plus a cafe, public toilets and disabled access lifts. The Imperial Standard Measures were moved behind the cafe seating and along the steps. 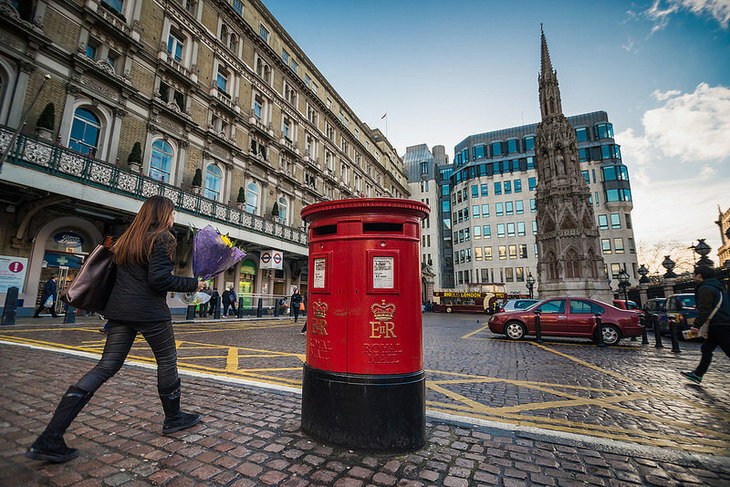 Charing Cross is technically the small traffic island south of Trafalgar Square. What many people know is that Charing Cross is the spot from where all distances to London are calculated. Photo by John Willoughby via the Londonist flickrpool. What many people don't know is how it got its name. In 1290 Eleanor of Castille, the wife of Edward I, died and her body was brought from Lincoln to Westminster Abbey. The cortege rested in 12 locations on the way and the last stop was at the village of Charing. An Eleanor Cross was erected at each stopping place, including one at this location, but this cross was destroyed during the English Civil War (1642-51). The Victorians built a replacement cross outside Charing Cross Station in the 1860s so the one you can see today is a copy and it's in the wrong place. 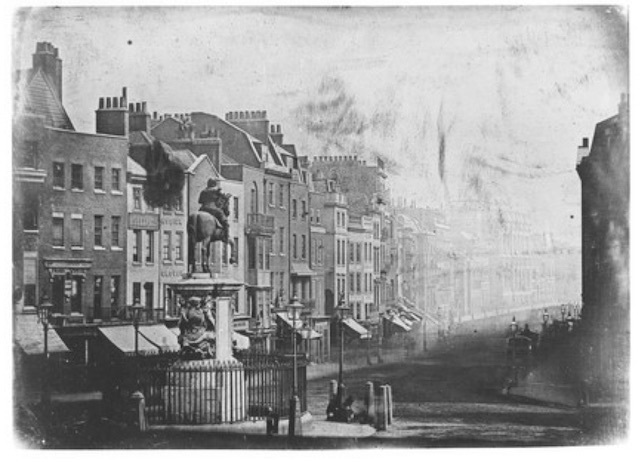 The monument at this location now is a statue of Charles I on a horse. The statue is by Frenchman Hubert le Sueur who knew the King. Statue of Charles I by champnet via the Londonist flickrpool. It was commissioned by Richard Weston, later first Earl of Portland, in the early 1630s. The statue stood in the grounds of Weston's Surrey mansion but after the execution of Charles I in 1649, Parliament ordered its destruction. One story says it was given to John Rivett, a brazier, who assured everyone it had been destroyed and even made a tidy profit selling commemorative knives and forks, apparently, made from the melted down statue of the dead king. When Charles II came onto the throne in 1660 and asked Rivett about the statue it was revealed it had been hidden in his garden all the time. Apparently, there was a fish shop on this now prestigious site, but it was removed so the Charles I statue could face down Whitehall. The statue has been here since 1674/5 when Joshua Marshall, who succeeded his father as master mason to the king, made the pedestal. This was also the site of the scaffolding on which the men who beheaded the king were then executed. There was a pillory here too for public abuse of n'er do wells (see pic). The statue was removed briefly for safekeeping during the Second World War, and stored in Leighton Buzzard. Before its return the statue had a few repairs, including adding a replacement sword and the badge of the Order of the Garter. The sword had been stolen when Queen Victoria opened the Royal Exchange in 1844. 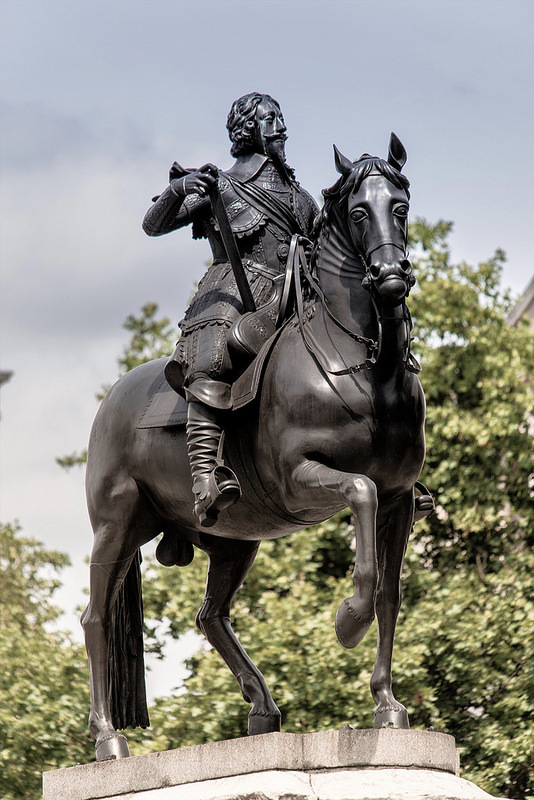 In the centre of the square was a bronze statue of General Charles Gordon with his cane under his arm, a bible in his hand and his foot on the broken barrel of a gun. The sculpture is by Hamo Thornycroft and was placed between the fountains in 1888. 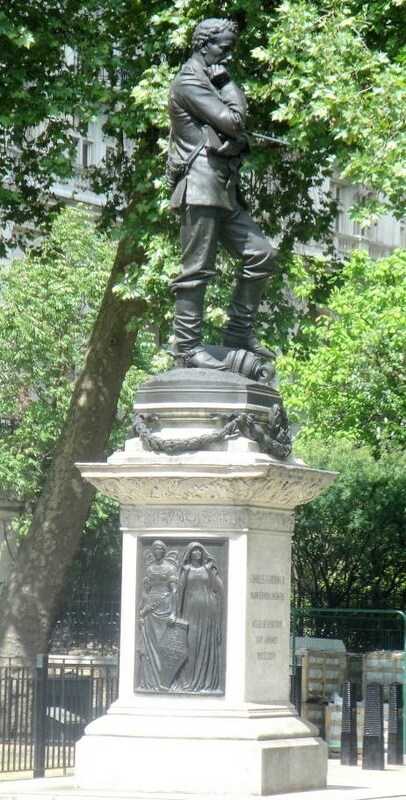 It was removed in 1943 and can now be seen on the Victoria Embankment. General Charles Gordon. Image from The Victorian Web website. A tribute to Edward Jenner, the man who discovered vaccination, was in the south west corner of the square, next to Napier. 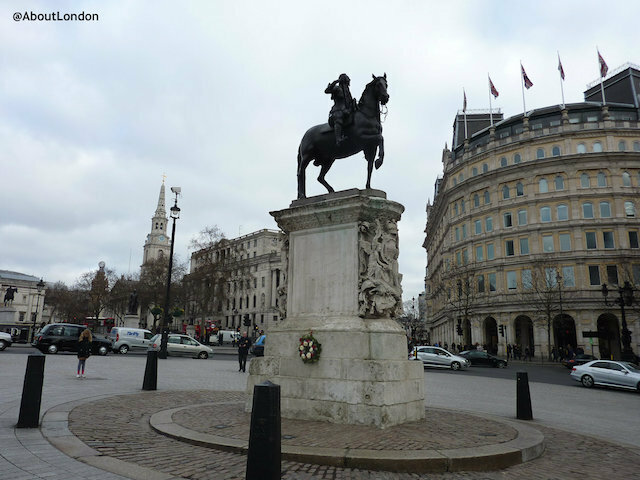 The sculpture by William Calder Marshall was placed in the square in 1858 but, after his biggest advocate Prince Albert died in 1861, the statue was moved to Kensington Gardens in 1862. 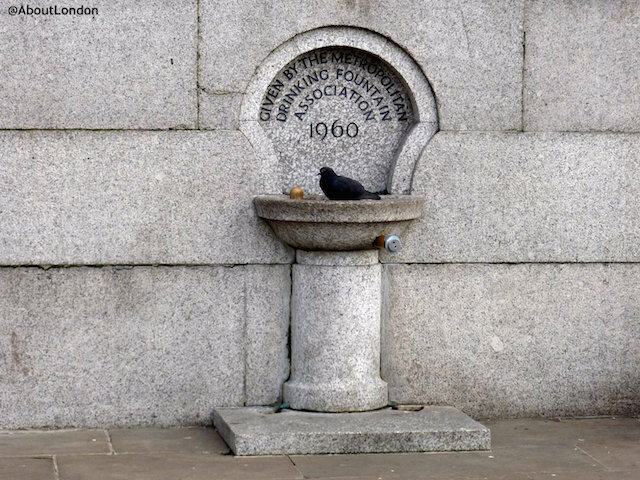 On the east and west sides of Trafalgar Square are public drinking fountains installed in 1960 by the Metropolitan Drinking Fountain Association to commemorate the organisation's centenary. These were designed by Stephen Dykes Bower who was the official surveyor of the fabric for Westminster Abbey in 1961-73 and was also involved in the restoration of St Martin-in-the-Fields after war damage.